Please use this thread to post all the updates, surveys, polls, joining, performance etc related to GE 2018.
on most of the seats there are more than 1 candidate for PTI and one some even 3 and 4 candidates and that is going to really hurt PTI when angry candidates leave PTI just before elections for not getting the ticket specially the nazryati ones they cry so loud and we saw the zamanat zabat nazryatis coming on number 3 back in 2013. But khan says this time they will ask all the candidates to take oath before they announce the tickets that they will not go against party decision. 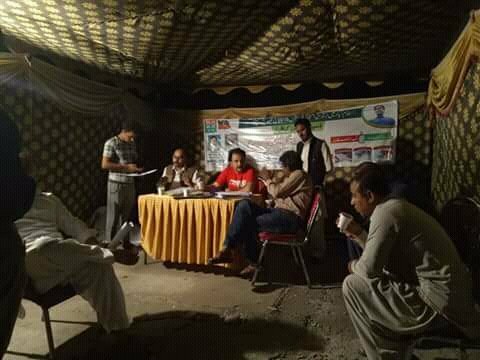 After membership campaign now PTI volunteers are organizing these voter awareness camps in different cities to educate people about how to register/transfer their vote. Good job PTI because we need more and more voters in the system to actually make any difference. Would love to know your thoughts @KingKhanWC on who has the best chance of winning the upcoming elections. Inshallah this is Imran's time. Also I hope after he wins elections and takes oath as PM he steps down as PTI chairman and let someone else hold the reigns and mould the party for the next five years. Should we all get our hopes up again for Imran? Aren't the so called "Shers" going to easily win again? Who do you think can that be? Wouldn't matter though if he is calling the shots. Makes no sense in stepping down either then. Doesn't matter how old he is, he IS the party and will be calling the shots anyways. Would be good though if there were was a younger IK in the party, informative but without the somewhat dementia. Will take a defective IK over the current bunch of crooks though. PTI tickets to be finalised on 4th May. Also, Imran Khan considering running from NA-243 Gulshan-e-Iqbal. I think PTI will enter Punjab with 22-25 seats from KPK in their bag. Of the 148 seats in Punjab if they manage to eek out say 60 and 10 from the 61 seats in Sindh. That puts them at about 95 seats. The independents that win from Fata and Baluchistan generally side with the party most likely to form government so that could be potentially another 20 seats. That brings them to about 115 seats. Still short of the 140 odd required to form government. I have also been quite liberal with my estimates because 60 seats from Punjab and 10 seats from Sindh seem difficult at this stage, but Allah maalik hai. Of course, the above estimates are before we have done any real campaigning. Right now, the teams are mainly working on getting people registered to vote. Starting from the 25th April, we will start all out campaigning. So hopefully, the above numbers will only go up. Talked to some people in Balochistan who said Balochistan is mainly about electables, and the new party formed by defects of other parties will probably win. I think anyone who wins in Balochistan always goes with whoever forms government, so we can probably add about 7 seats from there, taking us to about 98-106 seats. Then we have of course got independents, who join the winning party without fail, so add about 20 from there, taking us to 118 to 126 seats. PTI are pretty close with PML-Q, so we can count on them for about 2 -3 seats I reckon, taking us up to around 120 - 129 seats. If it turns out like this, we will need to form alliances with parties like PML-F, MQM/PSP to take us over the magic figure of 136. In Karachi, PTI are mainly struggling in all the seats in District Korangi, District Malir, and District West except on NA-239 (Shah Faisal Town + Model Colony), though they will need to work hard there. Another seat that looks difficult for now is NA-255 (Liaqatabad and Nazimabad). I was thinking about creating this thread but decided to wait till the current government finishes their term. But yes, it's about time we discuss the elections in one thread otherwise there will be plenty of threads about joining, tickets, people leaving parties, slogans etc. They will need to make alliance with all the Independents and i believe they can get decent support form Balochistan as well since PTI helped electing Senate chairman from there. MQM/PMLQ will also agree but then PMLN can probably offer them better deals. I thought it's time to start the discussion in one thread. I remember the GE 2013 thread it was created by you and was really active back thn many posters contributed in that thread. I guess not many of those posters are active anymore only a few are left from those old posters. Overseas pakistanis will able to vote in this election or not ? Mixed reports coming out. They are meant to be able to vote this time, but I am having doubts. same happened last time, not too much time left to make it a reality and how will it go by ? They have supposedly already started working on a system where overseas Pakistanis can vote online, which makes me sceptical because such things can be easily manipulated. I think PMLN will get support from MMA (likely to get around 10-15 seats) + Achakzai + ANP + MQM (if they don't form alliance with PTI) so looks like they will struggle to form the numbers so will need PPP's help for sure so it will be interesting government if PMLN and PPP join hands (won't last too long i believe). This thread is about Pakistan elections (and not PTI) so hoping to see PMLN supporters also contributing to hold healthy debate and discuss what PMLN's chances are and their policies. Not sure if there is any active PPP supporter @Major ? @Black_Zero ? I have huge reservations over such system, not many nations around the world have successfully done this and it will be more than a miracle if one of most incompetent and toothless Election Commission of Pakistan (ECP) can pull this off. Even if they somehow do, anyone can manipulate this so as much as i would LOVE to vote online, i don't think it will/should happen under this ECP. My question is simple, who is most likely to be the Prime Minister of Pakistan after the elections? Imran Khan or Shahbaz Sharif? If not now then never. PTI needs to win for the sake of this country. If Sheer wins again then i have no hope in this country and nation as well. Well Im a massive IK fan since childhood because of cricket and have had the pleasure of meeting him, shaking his hands and asking a couple of questions. I wish I was as optomistic as him, he truly believes one day the people of Pakistan will leave old failed, corrupt parties behind and choose a new destiny for Pakistan. For me and many others it's a no brainer to vote for PTI, not only because the party has no history of corruption but also because the leader has is not motivated by greed and power. Those in Pakistan may not agree but imo Pakistan is still stuck in old tribal culture for most parts. People vote for parties based on old alliances and what who their parents or grandparents voted for. My cousins are split , some want to continue voting for PMLN as their parents did but others want change. I think IK has a chance but needs to capture those voters who are undecided or turn around voters who vote based on tribal mentality. However PMLN are favourites but lets see. Though with the imminent conviction of NS and a potential exodus of electables from N-League things may change a lot. PMLN won 126 seats in GE 2013 so you think they will only lose 26-36 seats after all these scandals and after ruling for 5 years with delivering any fruits to aam aadmi and after the economy disaster? Exactly. Its basically do or die knockout game. Well going by the tv surveys i have seen (particulary the ones from Habib Akram on Dunya News) they still seem to enjoy some good support in most parts of the Punjab, so to me this doesnt seem very improbable. However as i said these are CURRENT estimates which dont factor in what may happen in the run up to the election. Things may very well change from soon! In Punjab vote shifts with electables so that can create a big difference in the end if many leave. Yes this what i have also noticed in the programms. Most people who were supporting PMLN were citing the performances of their MNAs, not their party or Nawaz Sharifs current narrative. So i guess on which platform these electables in the end are going to candidate will be also be an indicator of where things will be heading! Another factor we dont have to forget is the establishment factor! Many people may deny but their role will also be decisive in the question that which party will form the next govt! Looking at the confrontation course that NS has been taking recently it would really surprise me tbh if they would again allow PMLN to form the next govt! True and to give you an idea even in my own village only a few people vote for party (PTI or PMLN) but majority of voters are die hard supporters of an electable (who was independent in 2013) but now he moved to PTI so i guess if he gets the ticket most of the vote will now go to PTI thanks to him. At the bare minimum this guy will be disqualified, another seat lost for Nooras. Last edited by DeadBall; 19th April 2018 at 03:35. Yeah i have seen the clip. Quite shocking to me that even the lawmakers were involved in this. I mean if it were just supporters it wouldnt really surprise me as most loyal PMLN workers nowadays are very anti-establishment. But to see even lawmakers going as far to open such views publically is quite surprising. After the kicking all those lawmakers out, PTI will lose about 4-5 seats. 3 to PML-N in Hazara, 2 to MMA in South KPK. Video mein tou buhat dalayr bun raha tha "aoo humay giriftaar karo"
I was surprised too when nehal hashmi clip appeared i always thought Nehal Hashmi was one of those educated Karachiites and he use to be sensible on talk shows in early days. Don't know what's gone wrong or these guys are being pressurized by the top leadership to prove the loyalty by using aggressive and cheap language? The leadership already used Hanif Abbasi like a tissue paper poor guy is not even being given ticket in next election after all his efforts on media against IK with all those personal attacks and his case against IK. When RWP/Isb metro case opens in NAB i am sure Shahbaz Sharif will come clean but we will see hanif ababsi hanged. I doubt it... All those were first time ticket holders and not really electables..... This move has Infact improved PTIs standing in the eyes of the people. Not a bad move if this can earn PTI popular vote in Urban constituencies of Karachi and Punjab. Actually there were a few electable from Hazara and South KP. PTI was finally gaining ground in forever pro PMLN Hazara and pro JUIF+Molvis South KP so it's true PTI did lost a couple of seats with this move. Personally think that the kicking out was a bad move, IK needs all the votes he can get atm. Most of the vote bank are illiterate loyal people who could be fed more lies and propaganda or simply don't have a say in the matter. Better to have waited till election was won and government formed and then enforce these policies when in power. In the world of real politik these decisions are fudged in normal times but when you consider the timing close to the election, its even more brave. I say well done Kaptaan! How are you folks excitedly discussing this dog and pony show, when the military is clearly pulling strings and keeping everybody on a tight leash? PML-N is systematically being de-fanged, to make sure that they can't win re-election. PPP's power has been cut off at the knees by targeted actions in Karachi. New "parties" are being mainstreamed to ensure that even the PTI will not have a majority on its own. It is abundantly clear that there can only be one institution that can accumulate power in Pakistan. Any organization other than the army that gets big will get cut down to size. PPP's power has been cut off at the knees by targeted actions in Karachi. As i asked you earlier never jumps in discussions with no knowledge and research. Who told you PPP had any power in Karachi before actions or operations or before one decade or 2 decades or 3 decades? For your information although PPP is strong in Sindh and Karachi is part of Sindh but PPP never won in Karachi. Not in last 4 decades at least! @Syed1 this is really funny our friend from the other side of border thinks Karachi is a stronghold of PPP This is what happens when Google is your source of information and you to jump in other country's internal issues with no knowledge! Last edited by Syed2015; 19th April 2018 at 06:04. PTI did ok in Haripur and Abbotabad during GE2013 but they are really weak in Mansehra where on one seat Capt Safdar won and on other seat the electable Sardar Yousuf won and Yousuf is so strong he never lost his seat since 1988 no matter which party he joined currently he is also a federal minister. He met Khattak and was ready to jump the ship but PMLN stopped him with additional development funds and PTI wasn't in the mood to offer anything big. Gohar Ayub, Umar Ayub Family from Haripur also joined PTI recently. Abbottabad District Govt is also of PTI. So PTI can compete in 2 out of 3 Districts of Hazara. PTI had 2 out of 4 MPAs from Haripur in 2013 and a MNA from Abbotabad. Last edited by Mian; 19th April 2018 at 06:19. Couple of them are have a large votebank Hazara, and would have won. Hazara volunteers were all hoping for them to get tickets. ISLAMABAD - Another key leader of Pakistan Peoples Party (PPP) on Wednesday jumped the ship and joined Pakistan Tehreek-e-Insaf (PTI). Chan, who was considered as one of the close aide of Asif Ali Zardari, met PTI chief Imran Khan at his Bani Gala residence in Islamabad and announced to part ways with the party. PTI spokesperson Fawad Hussain in his tweet said that both leaders also held a discussion on the ongoing political situation in the country. Starting his political career as a tehsil nazim from Malakwal in 2001, Chan was elected to the National Assembly from constituency NA-64 in 2008 general elections on the PPP’s ticket. He also contested the general election 2013 from the same constituency but could not bag the victory. haha PTI is asking candidates to give this affidavit before the allocation of tickets that if they dont get the ticket they will not contest against PTI candidate who is given ticket. I've been listening to Chan on TV shows for a while... and always been impressed by his rationality and integrity. He is a great induction in PTI. Wish PTI could get Aitzaz Ahsan on board! Will never appen though. It's a shame, cos I was really impressed with him when Musharraf had his power struggle against the judiciary, PPP really have messed up going the dynastic route instead of having the most able lead them. True and he is also responsible for underachieving he had the brain and resources but always selected to be a worker and politician instead of a leader. Apart from Nadeem Afzal Chan, PTI is also in touch with another PPP jiyala from Punjab. His inclusion will be announced in the coming days, Imran Khan has already given the go ahead. Hmm wondering who this is going to be.... Maybe Kaira Sahib? I hope it's not Wattoo. Karia over all the jayalas combined any day of the week! Kaira would be a big time stunner... He seemed quite active for the PPP lately, didnt seem to give of any vibe of leaving the party..
Imran Khan is going to win. The result will alter sub-continental politics bigstyle.